Sometimes, a design decision is made from necessity, as a compromise between two different directions instead of choosing one over the other. In most cases, the approach of having a cake and eating it leads down a path that should have been avoided, but occasionally it results in a striking design that others may wish they had come up with first. It could be argued that the introduction of the "notch" in the iPhone X fits into this latter camp. Apple wanted to maximize the amount of screen available to the user, but still wanted to use some space for its TrueDepth camera array, with the notch becoming a solution that allowed the screen to go around the components. Though some would have preferred a design that hid the notch with a black bar across the top, Apple's approach to the problem has been largely embraced by users, and certainly didn't cause any harm to Apple's quarterly results. The compromise has effectively become the iPhone X's design calling card, with the notch becoming one of the most noteworthy aspects of the iPhone X's design. Of course, Apple wasn't the first to the market with a device that noticeably cut into the top of the display, as the Essential smartphone included a small notch at the top for its front-facing camera. Essential's handset launched months in advance of the iPhone X, and though it is unclear if they came up with the idea independently or jumped on the rumors surrounding Apple's device, it seems consumers were not enthused enough about it to acquire their own. Months after Apple brings a new iPhone out, elements of the design and even new features can crop up in smartphone launches by some Android vendors, keen to acquire users who may desire the iPhone aesthetic but at a cheaper price. For Mobile World Congress, taking place five months after Apple's September event and even longer after the first solid notch-related rumors came out, a few smartphone producers have gone down the same route. 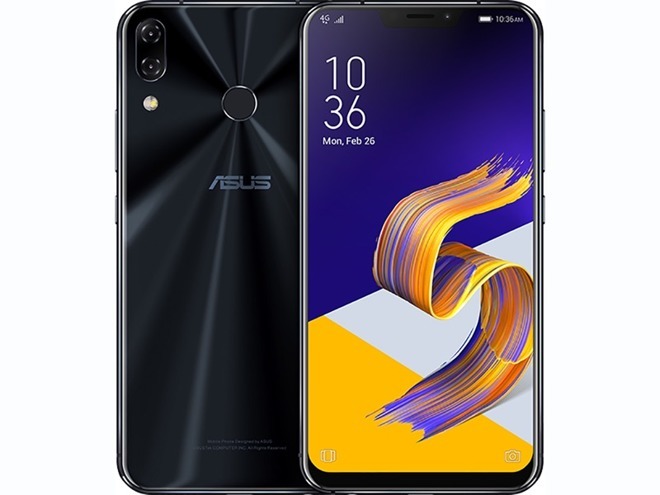 Asus used MWC to launch four different ZenFone models, including one with a high-capacity battery and a more conventional ZenFone 5 Lite. The two other phones, the ZenFone 5 and the slightly larger ZenFone 5Z were revealed to bear a striking resemblance to the iPhone X, thanks to the inclusion of a notch of the top of both device screens. Rather than shying away from direct comparisons between the devices, Asus has been upfront about how it was using the notch because Apple was doing so. Global head of marketing Marcel Campos admitted to The Verge "Some people will say it's copying Apple, but we cannot get away from what users want. You have to follow the trends." 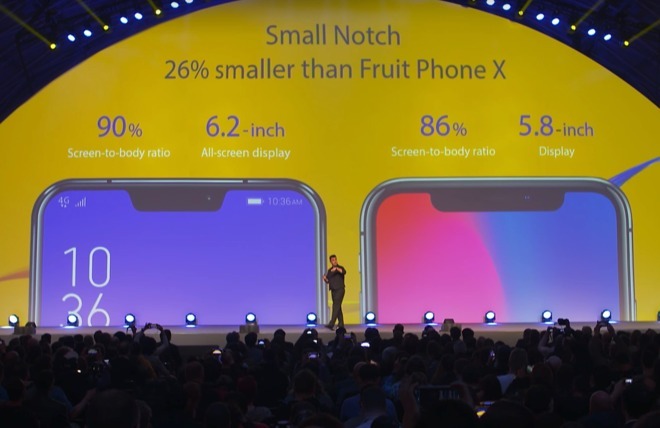 On stage, Asus actually compared its notch with Apple's, claiming to the attending press that its own was "26 percent smaller than Fruit Phone X." According to the company, the iPhone X has an 86 percent screen-to-body ratio for its 5.8-inch display, compared to the 90 percent of the ZenFone 5's 6.2-inch screen. Even the head of Asus has elected not to hide from direct comparisons between the smartphones. CNet quotes Asus CEO Jerry Shen as saying "Our price will be ... for everyone to enjoy compared to the fruit company," insinuating the ZenFone 5 is a cheap option for those who want to look like they own an iPhone X. Continuing down the road of cheap and "cheerful," the Leagoo S9 is seemingly trying to draw in Samsung customers at the same time as those who just want a notch-equipped phone. Images of the device from GSMArena show what could be best described as a low-cost clone of the iPhone X, including both the aforementioned notch and a strikingly similar rear camera assembly. 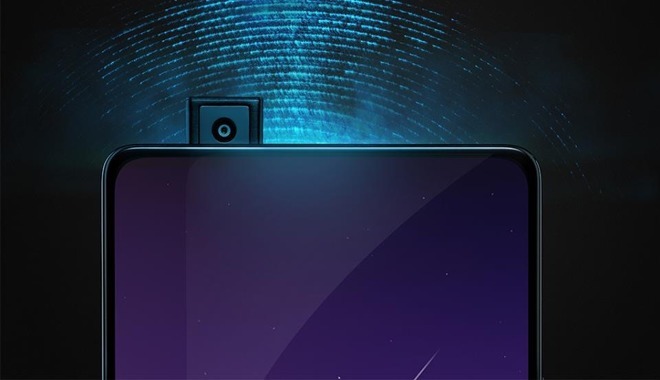 The notch itself appears to have been added purely for stylistic reasons, with a close-up shot showing a small circle for the front camera, the speaker vent, and nothing else. It also seems the company had failed to take into account the notch's size in software, as the battery indicator and the clock are slightly blocked from view by both the edge of the notch and the bezel. How much is it for this shining example of notch usage in a smartphone? A mere $150. 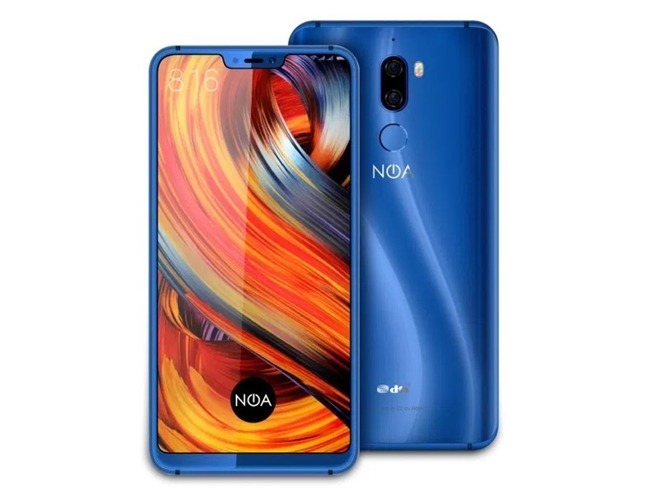 Another low-cost device revealed before MWC, the Croation Noa N10 does have a notch, but chooses to avoid mimicking the iPhone X. It's notch is best described as minimalist, opting for a small cut-away just large enough to contain all of the components it squeezes into that small space. In this case, while it could certainly be said that the iPhone X offered some inspiration for the $300 handset's screen, Noa elected to use the core idea of a cut-out to maximize the screen. Sure, it's using a notch, but at least it deserves credit by not directly trying to rip off a popular design. Extending into the world of rumors, Huawei is believed to be including a notch in its P20 smartphone, expected to be announced at an event at the end of March. Leaked in images by Evan Blass, the cutout at the top of the alleged device is a fairly narrow notch that does appear to be occupied with a camera and another component, making it a more practical example of the notch in practice. As this is an image leak for a rumored device, it is entirely plausible for Huawei to not launch the smartphone, instead opting for a more conventional display and camera arrangement. Considering the apparent proximity to its official unveiling and Chinese smartphone vendors having the tendency to use popular design ideas, it's more likely to keep the notch. Admittedly, not many of the major smartphone producers have opted to incorporate their own interpretation of the notch into their latest handsets. Companies like LG, Sony, Alcatel, and even Samsung have shown off hardware set to arrive on the smartphone market in the coming months that do not have notches, fitting all the items at the top of the display into an ever decreasing space while giving as much screen area as possible. Does this mean they won't incorporate notches in the future? No. These phone producers may turn towards using the notch in a future release, as it's certainly good enough for Apple to use, but may implement the technique it uses in different ways. Indeed, it is believed Google is working on the assumption that notches are here to stay. A mid-February report claims the next version of Android, nicknamed "Android P," will include native support for multiple displays and foldable screens, as well as for screens with notches and other missing elements. It may well be possible the manufacturers are working on their own solutions to the screen space issue, possibly one that doesn't involve any notch-like behavior. 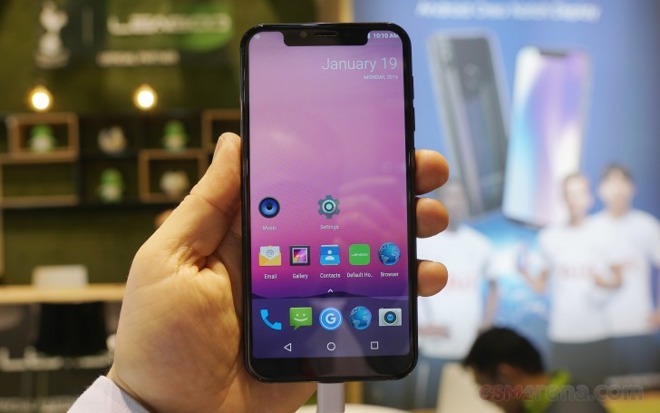 For example, Vivo showed off its Apex concept smartphone that has an edge to edge display with thin bezels, with its answer to the problem involving a pop-up camera that appears at the top of the device for self portraits, before retracting back into the phone's body. For the moment, it seems that Apple's lead of using the notch will be followed by others either inspired to do something similar to improve their own devices, or simply to cash in on what it believes to be a popular trend. Until another major company, or Apple, comes up with a better solution, be prepared to continue seeing bits cut out of displays for a long while.